Todd explains how to keep digital images and videos safe through backup hard drive storage. For the past fifteen or more years I have worked with literally hundreds of hard drives, both in my photography business and in my post-production business. One thing I can say with certainty is that all drives will eventually fail. One of the most dreaded phone calls is when a client has a hard drive failure and doesn't have a proper backup. The same is true with our digital images - I can't believe how many people keep their files on their computer and never backup to an external hard drive. Not only can your hard drive fail, but computers and hard drives can get stolen or damaged. Considering the expense that most of us spend on dive travel to take our photographs, backing up your images onto multiple drives is an inexpensive and valuable insurance. So which backup system is best for you? In my opinion, everyone should have a minimum of one working drive and two backups for both long-term storage and travel. Why two backups? The only way your files are truly safe is to keep a backup in separate location, such as at your office. However, the problem with keeping a backup offsite is that it's hard to keep it updated. My solution is to rotate the backup drives every few weeks, or whenever you are adding a large amount of images to your library. Most of us travel with a laptop. If you have enough space on your laptop drive this can serve as your main drive. I also like to backup to two portable drives. Even though I can't usually keep one of the backups in another location, having my data on three drives is a small price to pay for the added security. Making backups can become time consuming with big files, so I often make the second backup at night. Lightroom allows me to copy to the main drive and a backup simultaneously on import, so I always have at least two copies before I reformat my camera's memory card. I have had excellent results with the Lacie Rugged Drives, as well as the G-Tech portable drives. If you don't shoot a ton of images, having multiple CF or SD cards is another viable solution, but solid state storage is much more expensive than hard drive storage. 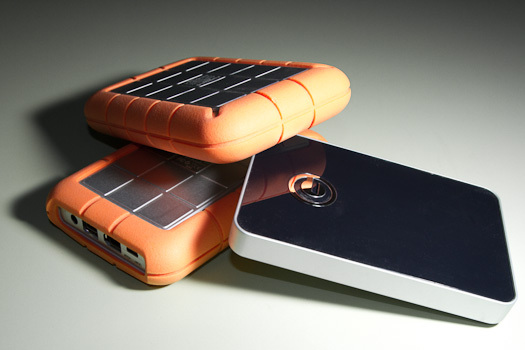 Lacie Rugged and G-Tech portable drives. G-Tech, Lacie and a Thermaltake BlacX drive dock. For long-term storage you can't go wrong with the JBOD (Just A Bunch of Drives) approach, or get a small desktop RAID (Redundant Array of Independent Disks). It all depends on how much data you need to maintain. If you are working with anything under two terabytes (TB), individual drives are a good solution. They are fairly inexpensive and can even be purchased without an enclosure and used in a drive dock. 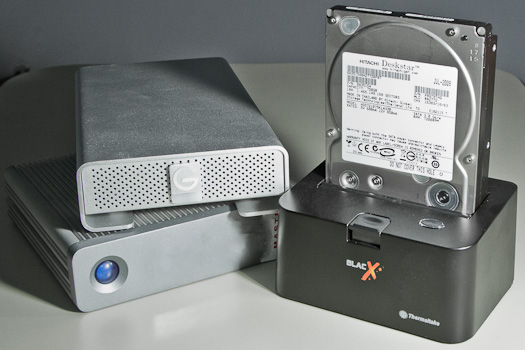 This is one of the most economical approaches for your backups. Above two TBs, you should consider investing in a RAID. RAIDs are made up of two or more drives and can have much larger storage capacity. Spreading the data across multiple drives typically gives you a faster read and write speed. This is not enormously important to still shooters but it is extremely important if you are working with large video files. RAIDs can also offer protection, which is one of the most compelling reasons to use them for long-term storage. Most RAID systems can be formatted to protect against one or more drive failures. RAIDs can be built with as few as two drives, but to see the real benefits of increased storage size and protection you should look for systems with four or more drive bays. I have had positive experiences with RAID systems from G-Tech, Caldigit and Drobo. 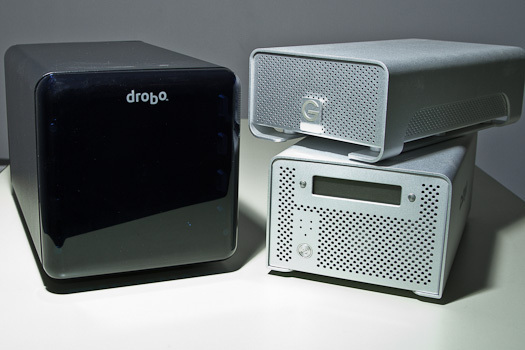 One unique advantage of the Drobo system is that it is expandable, meaning that if you run out of room, simply pull out the smallest hard drive and replace it with a larger one and the system will rebuild itself with no loss of data and more storage space. The downside to this expandability is that they typically have a slower read and write speed than other RAID systems. Drobo 4-bay, G-Raid and CalDigit VR desktop RAIDs. As a photographer, I know that our photographs are some of our most valued possessions, and most of us would be devastated to lose all of those images. No matter what system you choose, the goal is to keep your files up-to-date and in multiple locations. Remember - having backup drives won't do you any good if you never back them up! 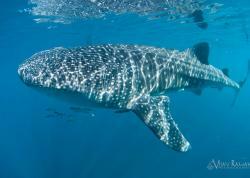 Todd Winner has traveled the world shooting underwater images. His work has be published in several magazines and web sites including, Sport Diver, Scuba Diving, Photographer, and Discovery. 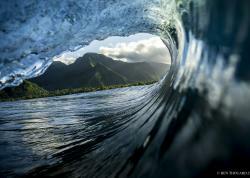 He has won numerous international awards for his underwater and travel photography. 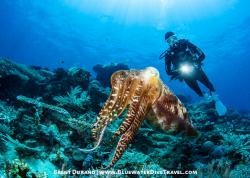 Be sure to join Todd on an upcoming Underwater Photography Guide workshop! More of his underwater images can be seen at http://www.toddwinner.com.